On August 20, 1983 the 15-year old Kerwin Duinmeijer from the Antilles, was stabbed by a 16-year old skinhead with a tattoo saying "a 100% white" on his arm, in the city center in Amsterdam. The perpetrator used racist language and after being stabbed, Kerwin ran to a taxi on Dam Square, but the cab driver pulled him out of the car because he didn't want to have blood on the seats, and left him on the street. A second taxi driver called an ambulance, that arrived 20 minutes later, too late to save the life of Kerwin. 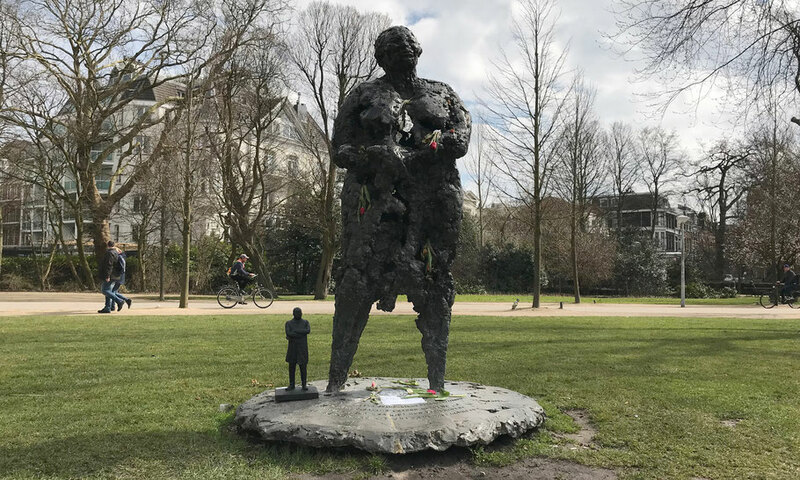 The memorial statue Mama Baranka by Nelson Carrilho was unveiled in 1985 and is located in Vondelpark. 'Mama Baranka' is Papiamento (the language of the Caribbean islands Aruba, Curaçao and Bonaire) for 'Mother Rock', in the Antillean culture the symbol of strength and perseverance. "So that we never forget where racism and intolerance can lead to."